Tesla’s had an amazing string of successes, cementing itself as a major player in the auto industry with the Model S all-electric sedan. With stories of its plans for country-wide charging stations, an electric utility vehicle, and its challenges against the traditional dealership model, it’s easy to forget that the car that started it all for the California based automaker was the lotus-derived Roadster. 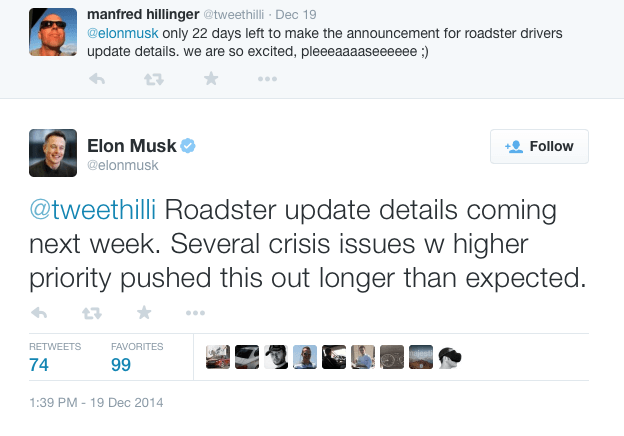 In a tweet made by CEO Elon Musk, it looks like things at Tesla are coming full circle. Clearly, there’s nothing solid about the car that we can take away from this, but it’s interesting to speculate what the electric car brand could come up with now that it’s no longer an up-and-coming company trying to muscle in on the combustion engine’s territory. It’s almost like reimagining what the original roadster would be like if Tesla had the same resources back then as it does now. The Roadster was developed around the chassis of the Lotus Elise, with extensive, unique modifications to the construction of the exterior, interior and, of course, the electric motor power plant. This produced outputs as high as 215 kW, or 288 horsepower, as was the case with the Roadster Sport. It also had a range of 245 miles. What can we expect for the new one? For starters, it’ll surely be all in-house built: no lotus derivatives here. We’re also confident that longer range will be an area of focus. As for power? We’ll be happy with the same 288 hp equivalent depending on how light the end result will be. The Lotus-derived Roadster was just to get things off the ground, as Tesla planned to manufacture its own cars from scratch, succeeding with the much acclaimed Model S sedan. Its next announced vehicle, the Model X SUV, is the next step forward in the companies history. With the future well on it’s way, it’s interesting to see Tesla go back to the well and see it tackle the sporty two-seater again now from a superior financial and technological position.